In early modern Florence, on Christmas day, most shops closed for business as they do today. However, let us imagine that the royal apothecary, Stefano Rosselli, kept his Speziale al Giglio opened for a few hours in order that his customers could pick up bundles of his specialty sweets; his pistachio calissons. 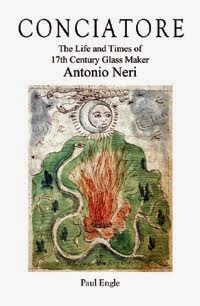 Around 1590 Rosselli started a recipe book which in time was handed down to his sons, who inherited the shop. There were actually three volumes, one for cakes and sweets, one for perfumes, and a third for medicinal remedies. Calissons are small confections which have been traditional sweets in the Provence region of France for centuries. Their modern incarnation usually takes shape of an almond, and consists of a candied fruit and almond paste base, frosted with royal icing. 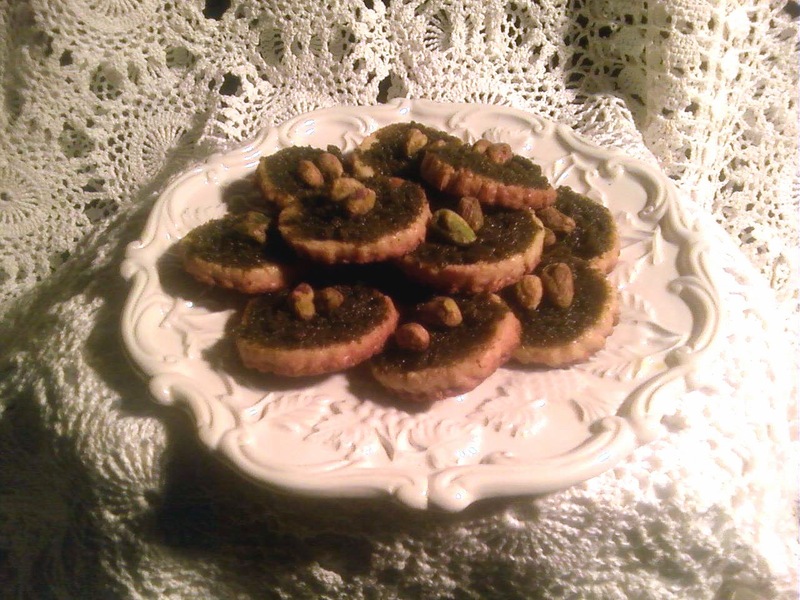 Here is Rosselli's version of pistachio calissons, recipe number forty-six from the first manuscript. Take marzipan paste: Lay it on the plates as you would for calissons, but with the dough thin in the middle. On the edges all around, make a round hem, half a finger thick, and sculpt as it is done for scallop-embellished cakes [torte ricamate], with a knife, small scissors or tweezers. Baking is like for calissons. Once cooked, you will need some dough made with pistachios mixed with a bit of musk, and you must drop it into the hollow and fill so that we can see only the hem, the rest is covered by the pistachios. Do not bake (the pistachio paste); otherwise it loses its color. These are nice things. To update the recipe, I started with a package of almond paste (Odense, 7oz/200g) from the grocery. This marzipan is made specifically for baking. It comes as a cylinder of paste which I cut into quarter inch slices (1/2cm), for a total of about twenty calissons. I arranged them on a baking sheet, on aluminum foil, and sculpted them into 1-1/2 inch / 4cm discs with a depression in the middle of each, building a low wall around their edges. I baked them in a 350deg F/ 175C oven, watching carefully, and pulled them out when they started to turn golden brown (8-10 minutes). The centers puffed up in the oven, so I gently poked them down with a spoon. Let them cool fully and they should peel off the aluminum foil easily. For the filling I start with a 6oz/170g bag of shelled pistachios, (roasted and salted). This is more than enough for twenty calissons. The pistachios used by Rosselli were undoubtedly Italian which have a dark green color, as opposed to mine which were a paler brown-green. Reserve a ¼ cup/60cc of whole pistachios for use as decoration later. I used a large mortar and pestle to grind the pistachios into a smooth paste. Later I tried a food mill (clean coffee bean grinder) and that worked well also. Grinding will first make a powder, but continue until a paste forms with the consistency and appearance of peanut butter. Work with smaller batches of about ¼ cup/ 60cc at a time until everything is made into paste. Musk is an aromatic product used in perfume, but also in baking (do not confuse one with the other; the perfume is not edible). In Australia musk is a popular addition to candies and buttercream frosting. I couldn’t find it in my area (Boston), so I substituted honey and rosewater, both popular flavoring used in early modern Florence. Add 2 tablespoons/ 30ml of rosewater and one tablespoon of honey to the ground pistachios and mix thoroughly. Gently spread the filling into the marzipan calissons with a butter knife. Add a pair of whole pistachios (reserved earlier) to the top of each calisson as decoration. Serve and enjoy. Of course, it is impossible to duplicate the exact ingredients used in the late sixteenth century. Beyond that, it is impossible for us to taste food as our ancestors did. Our likes and dislikes are influenced by the wider culture; the foods that we were brought up on are significantly different from the ones enjoyed by Rosselli and his patrons. Marzipan, by itself, can be overpowering but the pistachio takes the intense flavor down a notch. In my version, the lightly salted pistachios acted as a nice counterpoint to the sweetness of the marzipan. Even though this is not an exact duplication of the Renaissance era treat, this recipe is an enjoyable insight into some unusual flavor combinations of the past. Buon Natale.